I’ve read very little Nietzsche, but this famous passage in The Gay Science left a very strong impression on me when I first read it. It’s the context for the philosopher’s infamous assertion that “God is dead,” and after getting that context I finally understood what he meant. Many of you already know this, so I’m going to gloss it very quickly: Nietzsche is obviously not arguing that man literally murdered God. What he is instead suggesting is that man has surpassed and demolished an old, antiquated morality associated with our conception of God. And when the madman who brings this news realizes that he has “come too early,” this is because even the atheists who he tells this to do not grasp the implications. This parable is, I believe, even more salient now than it was in Nietzsche’s time. And it carries special significance for this generation of Americans. 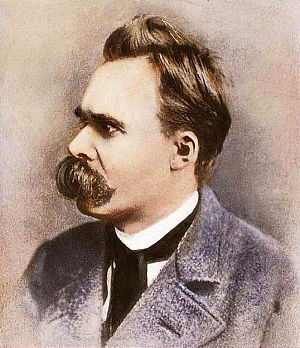 Our parents, the boomers, are the ones who, in Nietzsche’s words, “killed God”—they are the generation of the hippies, the civil rights movement, the sexual revolution, and the other various political and cultural upheavals that weakened the white, Christian, heteronormative patriarchy that until the past few decades has unquestionably dominated this country. This isn’t to suggest that racism, sexism and other traditional forms of American elitism are dead—only that the cultural norms that tied them into some kind of comprehensive national narrative are. Even the political movement most concerned with ostensibly returning us to the old system—the Tea Party movement—is essentially a nihilistic movement, motivated more by self-interest, directionless rage and various racial and classist resentments than a cohesive vision of how America should be. They seek to essentially undo the undoable. But that doesn’t mean we shouldn’t be worried. Just because the revolution already happened doesn’t mean it can’t still fail, and my biggest fear is that it will, for the reason that most revolutions fail: demolishing a cathedral is a lot easier than building a new one in the rubble. Tea Party nihilism is a monstrous ethical philosophy, and I’m no more satisfied by Nietzsche’s “master morality.” If this country is going to survive and flourish, we need to build a new, better morality. It is my conviction that the burden of doing so lies with my generation, and what scares me is that I don’t think we have either recognized or reacted to this burden.